Making merry during the holidays takes many forms. Decorations are a big part of the season. And, for those of us who live near the coast, or love the sea and its creatures, including marine life Christmas ornaments on our holiday tree is especially rewarding. There’s quite variety of sea life themed tree decorations available, including dolphins, starfish, seahorses, colorful tropical fish, and even crabs. Pick a few sea creatures to add to your tree, and enjoy the yuletide season even more this year. Ideal for the home with a nautical or coastal decor, they are especially enjoyed by children, and the young at heart, too. Special ornaments like these make nice little appreciation gifts during the holidays. The recipient will think fondly of you each time they take out their Christmas decorations. Some of these can be used all year long, too, as they are not holiday specific. When it comes to marine mammals, dolphins seem to be a universal favorite, so naturally, you’ll want some of these lovable sea creatures on your tree. 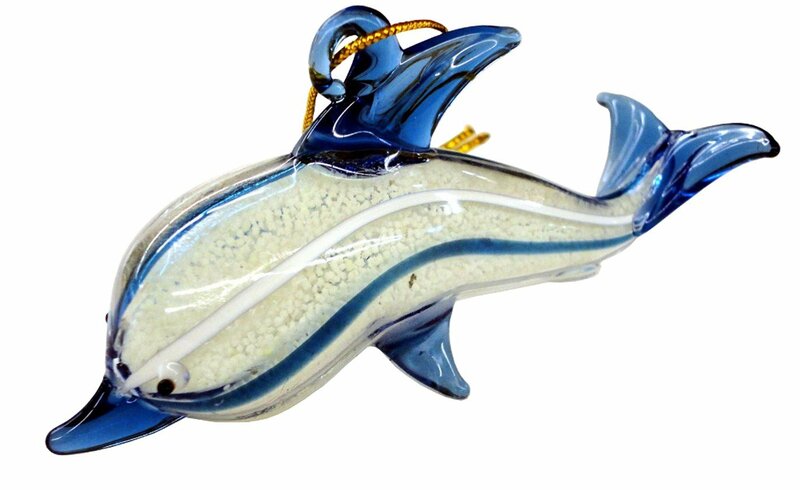 While there are quite a few dolphin ornaments to choose from, this particular one is a bit special, in that it glows in the dark. So, even when the lights are off, your special sea friend will show up! Made of blue, white, and clear glass, he’s about four inches long. Another favorite marine mammal is the whale. These large sea creatures that seem to fascinate us are distant relatives of the hippopotamus. The different types of whales vary widely in size. The smallest, the dwart sperm whale, larger than an average human, grows to about 8 1/2 feet long and weighs almost 300 pounds. However, the largest of all is the blue whale. They are the biggest creatures on the planet, and can grow to almost 100 feet long, and weighing over 400,000 pounds. Astounding! 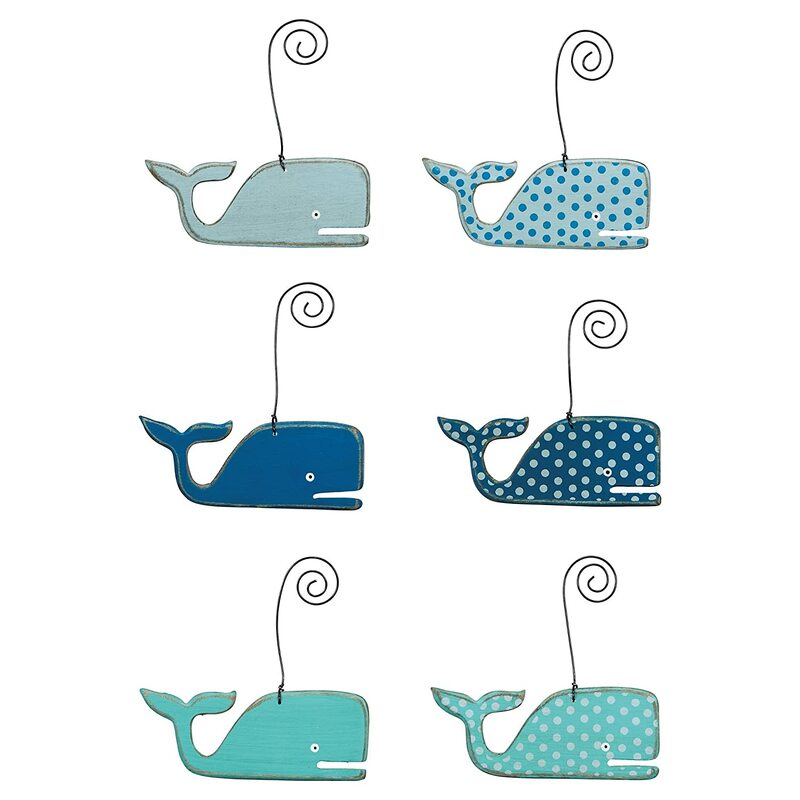 While an actual whale may be too heavy to hang on your holiday, tree, here’s a whole pod of fanciful ones that will do quite nicely, thank you. In colors of the sea, they’ll swim nicely among the branches, whether natural or artificial. You won’f find manatees in all parts of the globe like you will some other marine mammals. That’s because these gentle giants simply can’t survive in waters that are colder than 60 degrees. To see them in the wild, go to Florida, the Caribbean, or coastal West Africa. While they have no natural predators, many fall prey to habitat degradation, boat propellers, and ship traffic. Did y ou know that their closest living relative is the elephant? 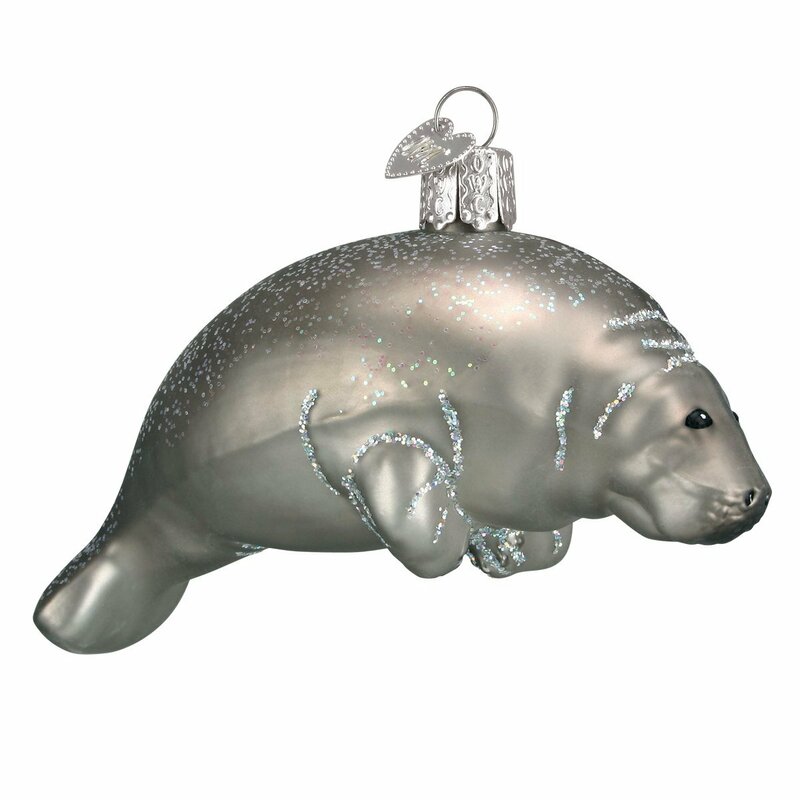 This Old World mouth blown glass ornament is a fairly realistic replica of an actual manatee, like the ones you might see on a trip to Florida. When you go, make sure the boat you’re in heeds the ‘No Wake’ zones, which are there specifically for the protection of the native manatees in the sunshine state’s waterways. Sea Lions are fabulous divers. Unlike humans, they can dive to depths exceeding 1000 feet without risking decompression sickness. That’s because they can actually control their heart rate, oxygen distribution, and gas exchange in their own bodies. What a phenomenal ability! Fish – really? Yes! Stingrays are actually fish. In fact, they are related to sharks. If you’ve been to the tropics, and participated in one of those ‘swim with the rays’ events, you likely have fond memories of these gentle creatures. Revive that memory each year as you hand a ray on your tree. This circular ceramic ornament features a photo of a ray gliding past a clump of seaweed that looks for all the world like a bit of a branch of a Christmas tree. How appropriate is that? And, since there’s a lot of blue in the photo, this pretty picture will go perfectly on a tree that has a lot of blue decorations – sea related, or not. Tropical fish are among the most colorful inhabitants of the world’s oceans. For an especially colorful tropical fish that’s also an actual work of art, look to artist G. Debrekht. If you’re looking for a very special little remembrance for a dear friend, or something that will be treasured for years by your own family, look no farther than this hand painted polywood piece from the Derovo Collection. 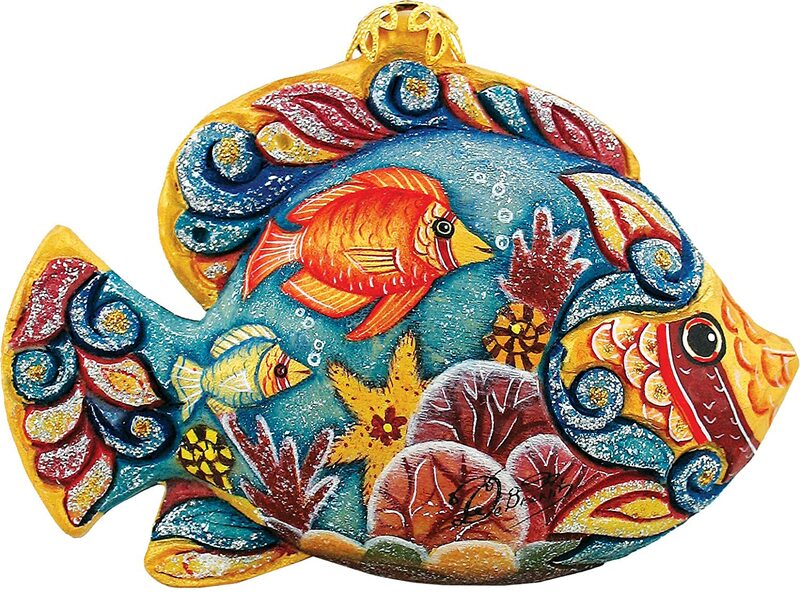 This stunning little holiday art sculpture is hand painted after the traditional Eastern European style. Ideal for gifting, it comes in a satin lined gift bos. A blued reef fish swims over soft corals in the Caribbean Sea just off the coast of Bonaire on this dated banner ornament. If you like to have a new ornament each year, and wold like to remember the year you acquire this one, just fill in the year in the blank provided. Alternately, change the verbiage in the date area to your family name or other brief text for a truly custom ornament. Shown here in gold metal, with a gold ribbon hanger, it’s also available in silver, with a matching ribbon. Though you may not think of them as such, seahorses are fish, too. And yes, in the wild, they come in nearly every color of the rainbow. But, these are fish who are lousy swimmers. That’s why you often see them anchoring themselves to seaweed or coral with their prehensile tails. They just can’t fight the current! 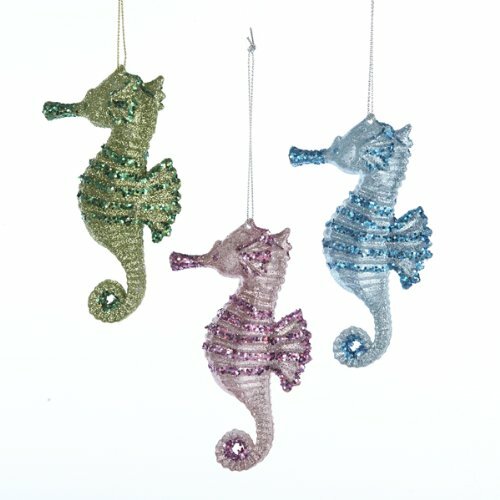 This pastel trio of seahorses will add some pretty color and nautical charm to your holiday decor. After all, there’s hardly anything more charming than a cute little seahorse. Unless, of course, it’s three of them. Jellyfish have survived for millennia, and are found in virtually every one of the world’s oceans. They inhabit the depths of the sea, all the way up to the surface. The various species of jellies come in a wide range of colors, sizes, and shapes. There has been a recent renewed interest in these creatures as subjects of art. 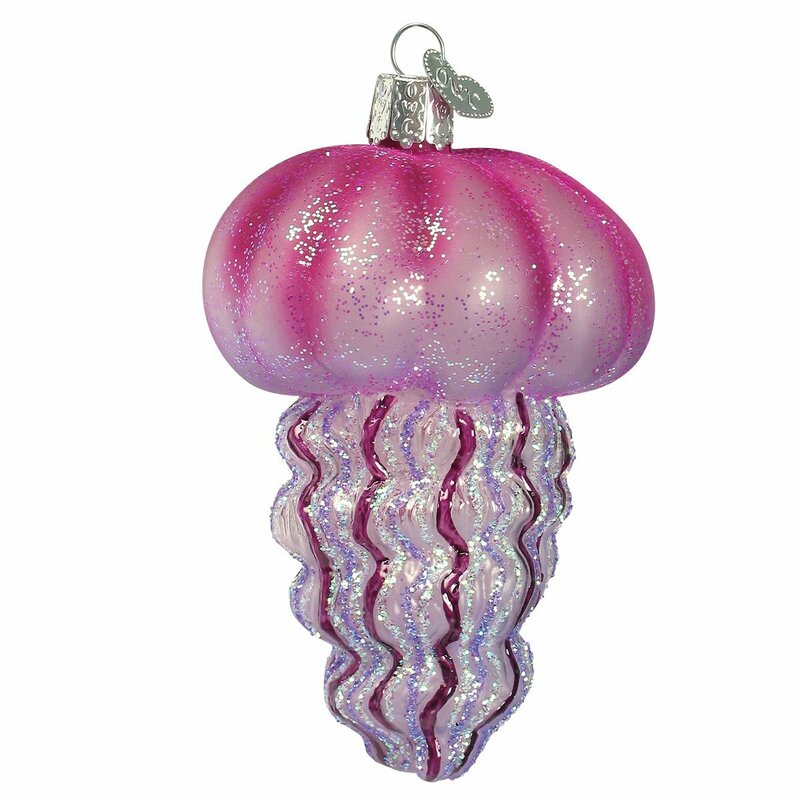 From Noble Gems, one of the preeminent names in holiday decor, comes this hand crafted jellyfish. In a bright pink, with added glitter, this sea creature will be a real standout on any tree. Octopi are fascinating creatures. Most everyone knows that the octopus has eight arms. But, did you know that they also have three hearts? They are also among the most intelligent of all cephalopads. Some species even use objects as tools. 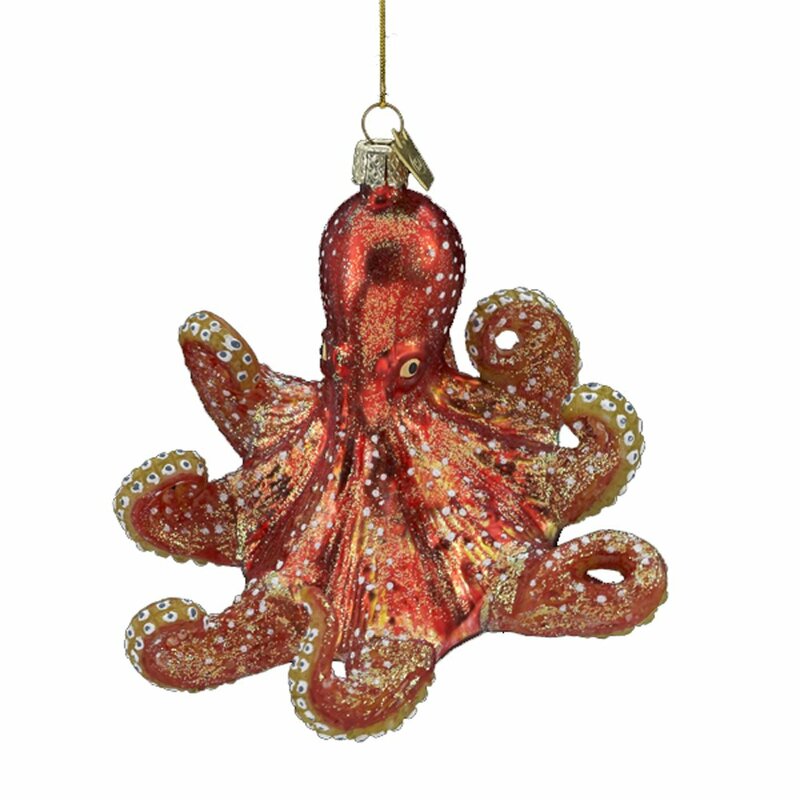 By Kurt Adler, and also from the Nobel Gems collection, this glittery red octopus ornament features hand painted details, including the many suction cups on his arms. 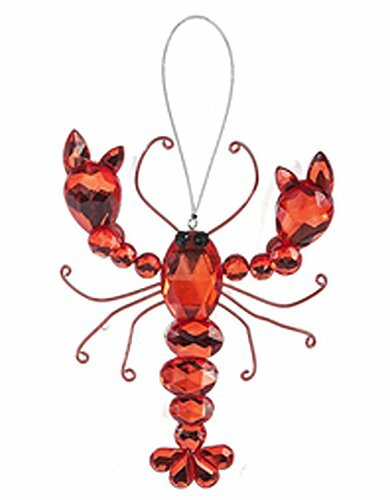 We all love lobster for dinner, but how about one as a holiday decoration? Well, why not? Octopus like to dine on these crustaceans, too, but don’t decorate with them for the holidays. 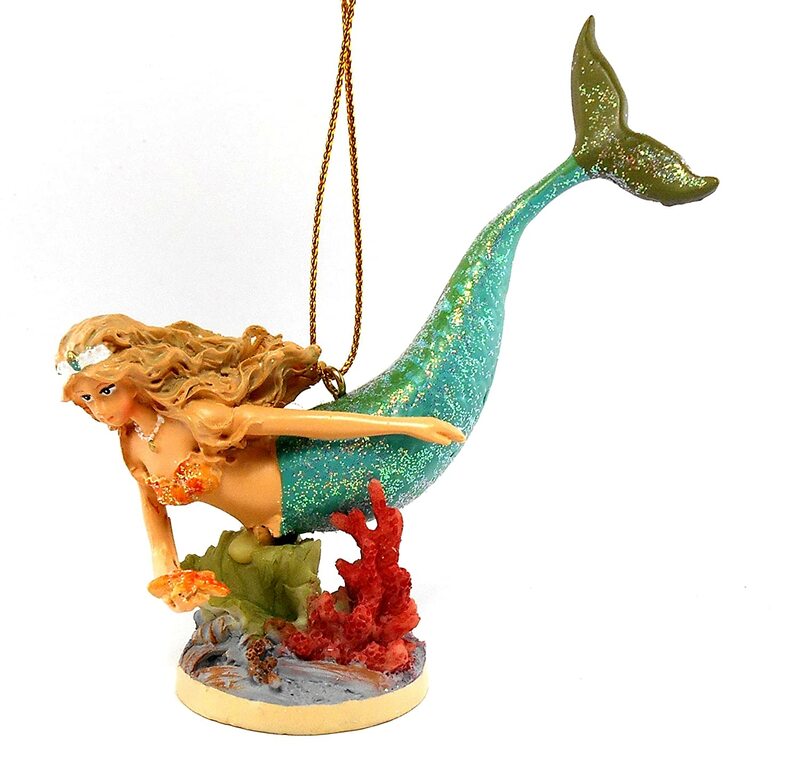 This sea life ornament is made from glittering orange faux crystals, and will hang nicely on a sturdy tree branch. At 5″ long, it’s a bit too much for a flimsy upper branch. But, it’s sure to catch the light, and be noticed wherever you place it. Do you believe in mermaids? Some do, and some don’t, and there are those on each side who are adamant. Then, there are those with no opinion. Whichever group you belong to, you probably agree that the idea of mermaids is a fun one. And they are a sweet idea for a sea themed Christmas tree, too. This one, made of hand painted resin, is just adorable, featuring an undersea theme with the mythical (or not?!?) creature swimming along the edge of a coral reef.